This program shows a fascinating diversity of styles: Scriabin’s Preludes op.11 are clearly moulded on Chopin’s Preludes op.28 in their Chopinesque melodic lines and extreme mood shifting. The Preludes are the most “old-fashioned” works on this disc, as we move on into the darker and mysterious world of late Scriabin with the Sonata no.10 and Vers la flamme (Towards the flame) - exalted creations of a mind seeking connection with the spiritual forces of the cosmos. The harmonic language of late Scriabin, the building of chords on intervals of a fourth (instead of the traditional thirds), finds a curious predecessor in “late Liszt”, whose Mephisto Waltz no.3, Nuages gris and Bagatelle sans tonalité use the fourth (or the augmented fourth, the tritone) as the basis of the melodic and harmonic discourse. 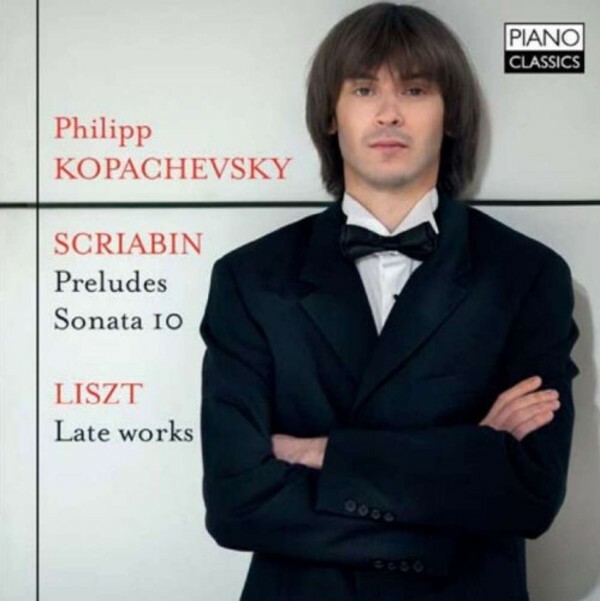 Philipp Kopachevsky is one of the most remarkable pianists of the younger generation. Winner of several international competitions he is in much demand as a soloist, having played with conductors like Rostropovich, Gergiev, Spivakov, Pletnev and many others.